Ecopilas guarantees that 100% of the collected batteries are treated in specialised recycling plants, obtaining recycling ratios of more than 70% and avoiding damage to the environment or health that could be caused by improper management of used batteries. Recycling allows the use of secondary raw materials obtained from waste, which in some cases can be reintroduced back into the production process of batteries or used to manufacture other products. The technology for recycling waste batteries is different depending on their chemical composition. Saline/alkaline (83% of the total battery waste collected) are recycled in Spain. Rechargeable and primary lithium (Lithium-Ion, Ni.Mh, Ni.CD, Primary Lithium) are recycled in European treatment plants. In this mechanical phase the waste batteries are subjected to a fragmentation process where the size is reduced facilitating the separation of the materials that make up the battery. This first step makes it possible to classify the materials obtained according to their composition and then send them to specific processes. Plastics that will be later recycled and plastic granza will be obtained. Ferrous metals of the metallic casings whose destiny will be the iron and steel industry to obtain new steel. The collections made by the Ecopilas foundation are always from what we call a “battery mix” in which we can find on average the following composition. a| Pyrometallurgical: treatments at high temperatures that allow the recovery of the metals contained in the batteries for their gasification and subsequent purification and sedimentation. Waelz furnaces are installations in which zinc dust residues and other residues coming from this industry are treated. Due to the high zinc content of the saline/alkaline batteries it is possible to recycle them in this installation obtaining different products with a high zinc and manganese content. Lead smelting: lead plates are subjected to a melting and purification process after which lead ingots are obtained, suitable to be used again as raw material, in most cases for the manufacture of new batteries. b| Hydrometallurgical: physical chemical treatments that recover metals through dissolution processes with additives and subsequent concentration or purification. The black mass (non ferrous fraction of the saline/alkaline piles) can also be treated with this technology, obtaining high purity fractions of zinc and manganese. As a result of this second phase, depending on the technology being treated, the chemical components that form the batteries in different chemical states (Zinc, Manganese, lithium, cobalt, lead, nickel, cadmium…) will be obtained. Some of them are used again in the production of new batteries and others are destined for iron and steel or other processes. But what comes out of recycling a battery? 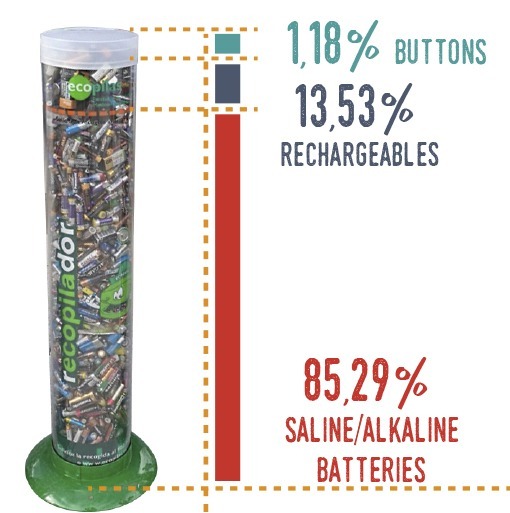 In the following link we present the section “alkaline batteries” (the most used and known) in which we explain which are their main parts and the average of their recycling.